Here is an interesting article on how the psychology of race affects political action. And how it is threatening democracy. The research suggests that when intolerant white people fear democracy may benefit marginalized people, they abandon their commitment to democracy. Since the founding of the United States, politicians and pundits have warned that partisanship is a danger to democracy. George Washington, in his Farewell Address, worried that political parties, or factions, could "allow cunning, ambitious and unprincipled men" to rise to power and subvert democracy. More recently, many political observers are concerned that increasing political polarization on left and right makes compromise impossible, and leads to the destruction of democratic norms and institutions. A new study, however, suggests that the main threat to our democracy may not be the hardening of political ideology, but rather the hardening of one particular political ideology. Political scientists Steven V. Miller of Clemson and Nicholas T. Davis of Texas A&M have released a working paper titled "White Outgroup Intolerance and Declining Support for American Democracy." Their study finds a correlation between white American's intolerance, and support for authoritarian rule. In other words, when intolerant white people fear democracy may benefit marginalized people, they abandon their commitment to democracy. In other words, when intolerant white people fear democracy may benefit marginalized people, they abandon their commitment to democracy. The World Values Survey data used is from the period 1995 to 2011 — well before Donald Trump's 2016 run for president. It suggests, though, that Trump's bigotry and his authoritarianism are not separate problems, but are intertwined. When Trump calls Mexicans "rapists," and when he praises authoritarian leaders, he is appealing to the same voters. Miller and Davis' paper quotes alt right, neo-fascist leader Richard Spencer, who in a 2013 speech declared: "We need an ethno-state so that our people can 'come home again'… We must give up the false dreams of equality and democracy." Ethnic cleansing is impossible as long as marginalized people have enough votes to stop it. But this roadblock disappears if you get rid of democracy. Spencer understands that white rule in the current era essentially requirestotalitarianism. That's the logic of fascism. Trump's rise is often presented as a major break with the past, and as a repudiation of American values and democratic commitments. But in an email, Miller pointed out that white intolerance has long served as an excuse for, and a spark for, authoritarian measures. "People are fond of the Framers' grand vision of liberty and equality for all," Miller says, "but the beauty of the Federalist papers can't paper over the real measures of exclusion that were baked into their understanding of a limited franchise." Black people, Asians, Native Americans and women were prevented from voting for significant stretches of American history. America's tradition of democracy (for some) exists alongside a tradition of authoritarianism (for some). The survey data doesn't show people rejecting American traditions, then, Miller says, so much as it shows "a preference for the sort of white-ethnocentrism that imbued much of the functional form of democracy for the better part of two centuries." America's tradition of democracy (for some) exists alongside a tradition of authoritarianism (for some). The Founders supported democracy as long as it was restricted to white male property holders. Today, our understanding of democracy is more expansive — at least in theory. In practice, the GOP has increasingly been embracing a politics of white resentment tied to disenfranchisement. "Since Richard Nixon's 'Southern Strategy,' the GOP has pigeon-holed itself as, in large part, an aggrieved white people's party," Miller told me. Trump's nativist language made the GOP's sympathies more explicit, leading to further erosion of support among non-white voters. George W. Bush won 35 percent of Hispanic voters in 2000; Trump won only 28 percent. His showing with Asian-American voters was only 27 percent — worse than any winning presidential candidate on record. White people continue to decrease as a percentage of the U.S. population; at some point, it's going to be impossible to win a national, democratic American election with a platform that alienates people of color. The GOP, seeing their coming demographic apocalypse, has pushed voter ID laws and other barriers to voting to try to prevent black and other minority voters from getting to the polls. In Wisconsin, Republican Governor Scott Walker even attempted to delay elections for state seats that he believed Democrats would win. White people continue to decrease as a percentage of the U.S. population; at some point, it's going to be impossible to win a national, democratic American election with a platform that alienates people of color. "The GOP has dug itself into such a hole on this that the most practical effort to stave off these impending losses is to disenfranchise the votes of the same ethnic/racial outgroups against whom GOP messaging has been stoking animosity," Miller tells me. A party built on demonizing and attacking marginalized people is a party that will have to disenfranchise those same people if it is to survive. Blaming authoritarianism on partisanship suggests that both sides are equally to blame for the erosion of democratic norms. But greater commitment to abortion rights and free healthcare in the Democratic party isn't a threat to the foundations of democracy. The growing concentration of intolerant white voters in the GOP, on the other hand, has created a party which appears less and less committed to the democratic project. When faced with a choice between bigotry and democracy, too many Americans are embracing the first while abandoning the second. "Social intolerance isn't just leading to GOP support as we know it and see it now," Miller says. "It's leading to preferences in favor of the kind of candidate the GOP ultimately nominated and supported for president." 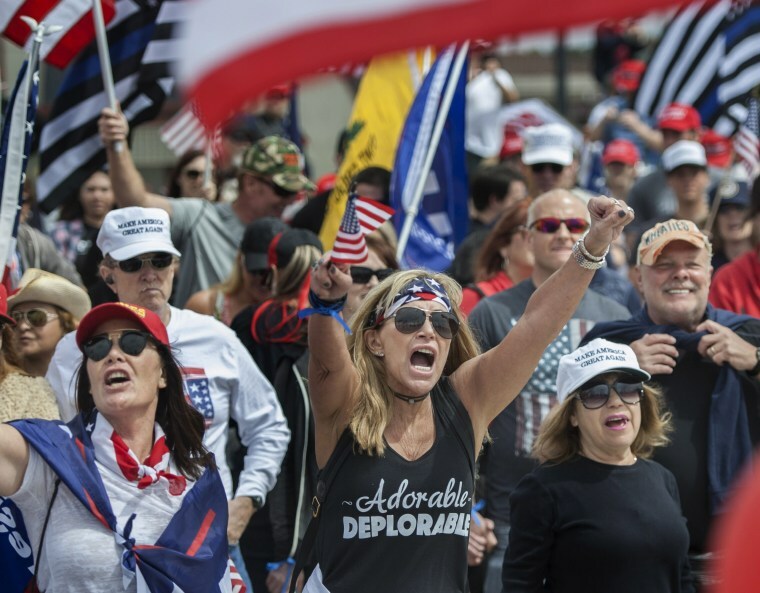 In embracing the politics of white identity, then, the GOP made a Trump possible — and is likely to make more Trump-like candidates successful in the future.